This may come as a shock to you, but I sometimes don’t have time to cook elaborate 3 hour meals. In fact, most weekdays I try to focus on meals that are really fast to prepare. I’m talking about a meal that takes less than probably 20 minutes to prepare and cook. I’m talking about a meal like these simple mushroom fajitas. One of my favorite styles of food is Tex-mex. I love the flavors and most dishes are pretty quick to prepare. I also like them because they have a lot of different levels of complexity. So, for example, I could have made my own tortillas, made the guacamole from scratch, made some salsa, and probably done some other things that would have made the dish a little better, but would have also added an hour onto my prep. I love doing that. But some days I just don’t have time. 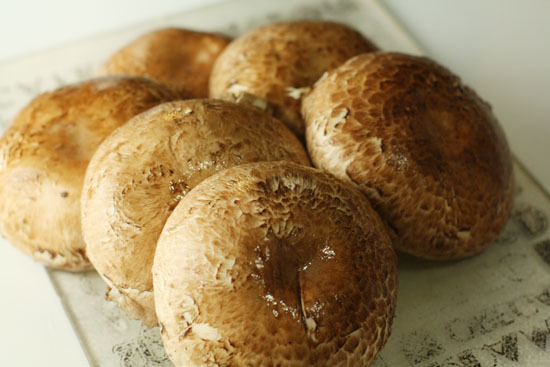 1) Wash the mushrooms in cold water and make sure to get off any dirt. No need to scrub them really hard or anything. 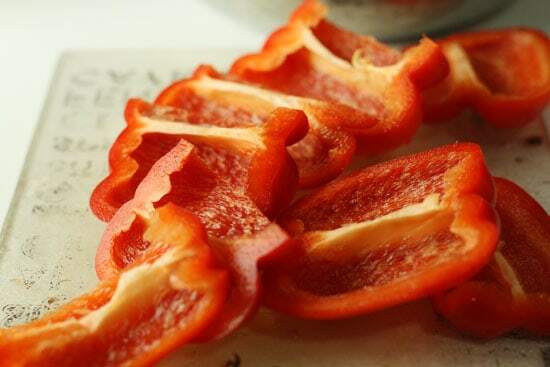 2) Cut the peppers into quarters before slicing then up and de-seed. Dice up jalapeno peppers. 3) Whisk vinegar and oil together and poured that over my veggies as a marinade. Let these sit for a few minutes before cooking. 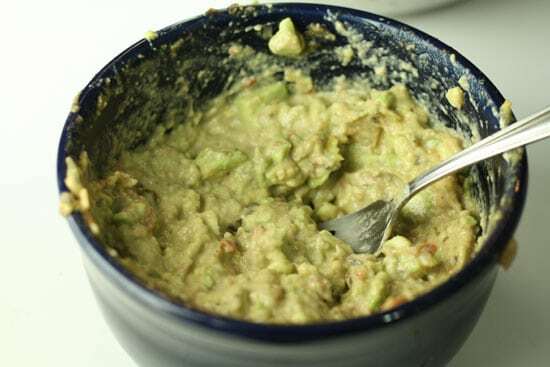 5) Make the cheater’s guacamole – mush up avocados and mix it all the other stuff. 6) Preheat oven to 350 so it will be warm for the tortillas later. 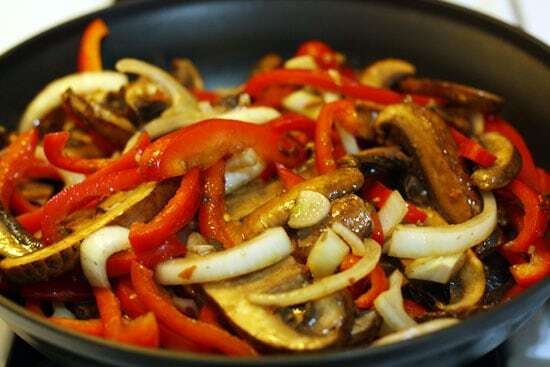 7) Put a skillet over high heat and once it’s hot, add all of the veggies at once for a few minutes. 8) Put the tortillas in the oven to heat them up. They only need about 15 seconds to be warm. 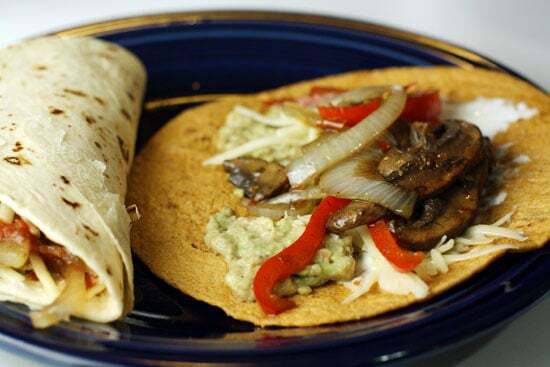 9) On the warm tortilla, layer guacamole and sour cream. 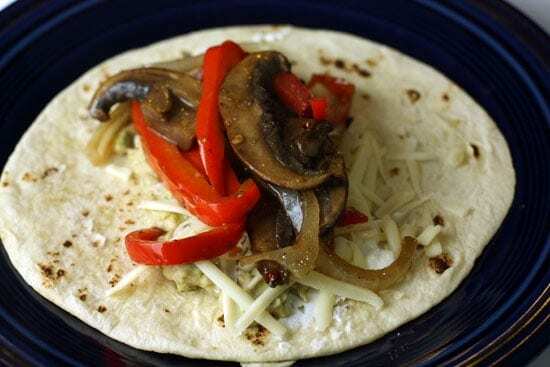 Then add some cheese and top with veggies! For the mushrooms, wash them in cold water and make sure to get off any dirt. No need to scrub them really hard or anything. For the peppers, I like to cut the pepper into quarters before slicing then up. This is a quick way to de-seed the peppers. Just cut around the pepper from the stem down. You’ll be left with a stem with the seeds and four even quarters of peppers. Now normally I would add some jalapenos to the party for a little heat, but for this version I used a gift that a reader sent me. Yep. 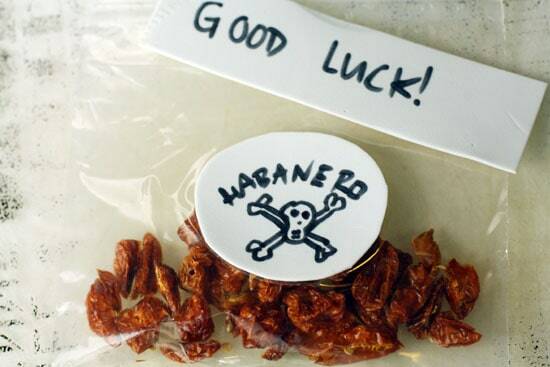 Those are dried habanero peppers. I diced up 4 of these guys and added them to the party. They definitely provided LOTS of heat to the mix. I like things really spicy and if I were making it again, I think I would have added a pepper or two more or added one jalapeno. These were awesome though. Thanks to Kristine for sending them my way. The key part of making good fajitas is to make sure that all of your ingredients are roughly the same size. This makes it easy to cook because you can throw everything in at once! Before cooking though, I whisked my vinegar and oil together and poured that over my veggies as a marinade. I let these guys sit for a few minutes before cooking. Try to get everything the same size. 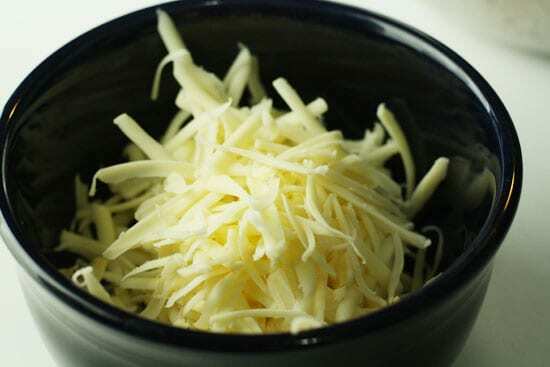 While you’re letting your veggies marinate, grate some cheese! And I also made some cheater’s guacamole. I didn’t have time to make real guac, so I just mixed up a batch of what I call cheater’s guac. Just mush up your avocados and mix it all your other stuff. Should just take a few minutes to throw this together. Next, preheat your oven to 350 so it will be warm for the tortillas later. The very last thing you want to do is cook the veggies. They only take a few minutes and you want everything else to be ready to go once they are done cooking. 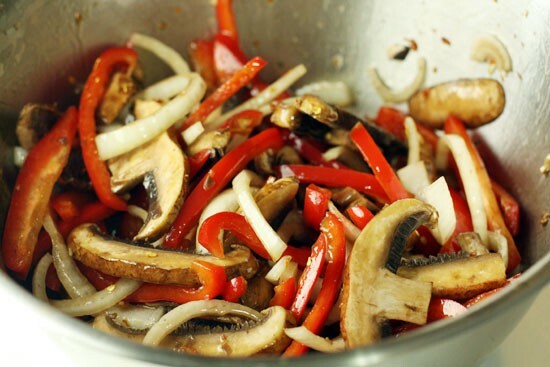 To cook them, put a skillet over high heat and once it’s hot, add all of your veggies at once! Can’t get easier than that! They should only need to cook for a few minutes. You want them tender, but not limp. I like my fajitas to be layered in a specific way because I’m kind of OCD about some things. I start by sticking a tortilla (a few actually) in the oven to heat them up. They only need about 15 seconds to be warm. I start with a layer of guacamole and sour cream. Then I add some cheese. Then I add my veggies! I like making them in that order because the sour cream and guacamole are evenly distributed and the cheese gets melted a bit which is always good. Nothing fancy, but very tasty! I almost didn’t post this recipe because it isn’t anything special, but I’ve been getting some requests from readers for simple and easy dishes and this is definitely in that category. Also, simple and tasty are not mutually exclusive. This recipe happens to be both of those things! Yum. How about doing migas sometime soon? Another riff on the same theme. I'm not usually a fan of veggie fajitas but I'd be all over those, Kevin. 4 habs? Really? Are the dried ones much milder than fresh? Because I only use 1-2 habs in my jerk chicken. Looks really good. I’m going to try marinating veggies I use for fajitas.